You can enjoy homemade ice cream quickly and easily with an automatic ice cream maker. Or, for a touch of nostalgia, you can also use a traditional manual hand-crank maker. 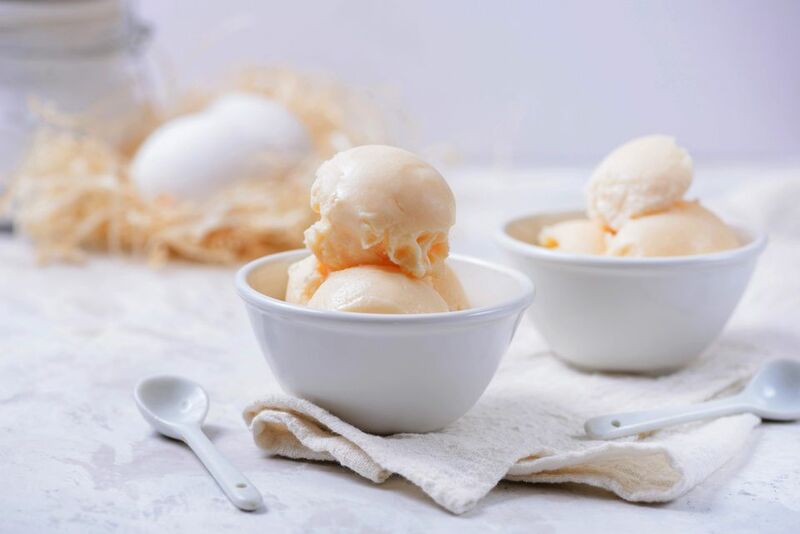 A very easy recipe for custard-based ice cream uses an egg mixture that is cooked to thicken it before transforming it into ice cream. Once you master this recipe, you'll be ready to try other flavors. Before you begin, make sure that the freezer bowl on your ice cream maker is completely frozen. It's a good idea to put it in the freezer a full 24 hours before you plan to make the ice cream. Some people even store the freezer bowl in the freezer so that it's always ready to go when they're craving ice cream. 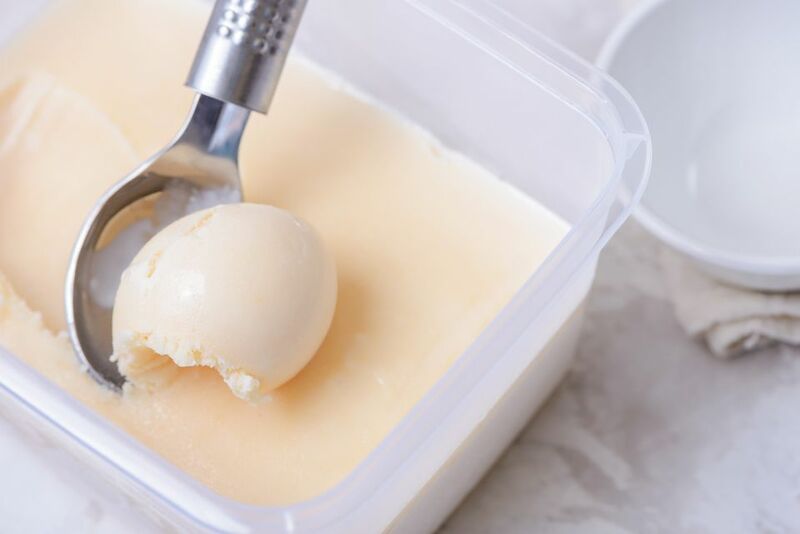 Also, allow enough time for the custard to chill before you plan to make the ice cream—it can take several hours for a prepared custard base to chill completely. Break the eggs into a medium mixing bowl and whisk in the sugar and the salt. Continue whisking until the mixture is frothy and lemony yellow. The beginning step of heating the custard and adding cream is called tempering. By adding the hot cream to the cooler eggs gradually, it prevents the eggs from getting scrambled. In a medium-sized saucepan, heat the heavy cream over medium heat until it just starts to simmer. Gradually add the heavy cream, a little at a time, to the eggs in the bowl, whisking constantly. Tip: put the mixing bowl on a dish towel to hold it in place while you whisk. Cooking the custard now begins in earnest. Make sure to stir continuously to avoid burning. When all the cream has been added, pour the cream-egg mixture back into the pan. Cook the mixture over low heat, stirring constantly, until it thickens enough to coat the back of a spoon. When you run your finger across the back of the spoon, the stripe should remain in place. It will take about 5 to 8 minutes of heating for the mixture to thicken to this degree. Once it is cooked, the custard will need to be strained to prepare it for making into ice cream. Remove the mixture from the heat and strain it through a fine mesh colander into a bowl to remove any scrambled egg bits. This part is optional if you're in a hurry and don't see a lot of little particles in your mixture, but it does make smoother ice cream. Cool the mixture slightly, then stir in the half-and-half cream and the vanilla. Cover with plastic wrap, and refrigerate until cold—several hours or overnight. When you're ready to make your ice cream, remove the freezer bowl from the freezer and assemble your machine according to the manufacturer's instructions. Turn the machine on first, then pour in the ice cream base. If you're using an ice cream maker that uses ice and rock salt, such as the Hamilton Beach 4-Quart Ice Cream Maker, follow the manufacturer's instructions to layer ice and salt in the barrel. As your ice cream maker churns the custard, you'll gradually see it thickening. The custard that's in contact with the sides of the bowl freezes, while the paddle continuously scrapes it back into the middle. Depending on your machine and how chilled the custard was initially, the ice cream should take 15 to 20 minutes to thicken up. Start checking it after 10 to 12 minutes. When it's finished, the ice cream should hold its shape when scooped with a spoon, but you can freeze it to whatever firmness you want. If you want to add ingredients such as nuts, fruit, or candy bits, add them after about 12 to 15 minutes, when the ice cream is starting to solidify but before it gets to your desired consistency. Your mix-in pieces should be no larger than the size of a chocolate chip. When the ice cream is done, use a rubber spatula to immediately scoop it out of the freezer bowl—if you wait too long it'll freeze to the sides. Transfer the ice cream to a freezer-safe container and put it in the freezer, or serve yourself a scoop or two to enjoy immediately! By the way, many homemade ice creams get very hard when they're frozen for any length of time. This is because most recipes don't contain the ingredients added to commercial ice creams to prevent them from becoming rock-hard. If you are making your ice cream to serve at a later time, take it out of the freezer about 15 to 20 minutes before you plan to serve it so it will be scoopable.